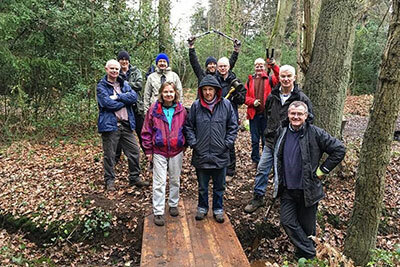 The Conservation Volunteers have received funding from Richmond Parish Lands charity to improve the pond on the common, replace the small bridge, make improvements to the hazel coppice area and create a new amphibian friendly environment. This follows the discovery of wild heather (Calluna vulgaris) on the common. Heather was last seen on the site 150 years ago when it was primarily acid grassland, a UK priority habitat before it became a wooded area. Alongside the Friends of Sheen Common, The Conservation Volunteers (TCV) will now focus on removing the bramble and scraping back the leaf litter to clear the way for this historic grassland to return to the area. Lear more about the The Conservation Volunteers.